This is my first in a series about heart monitor training. 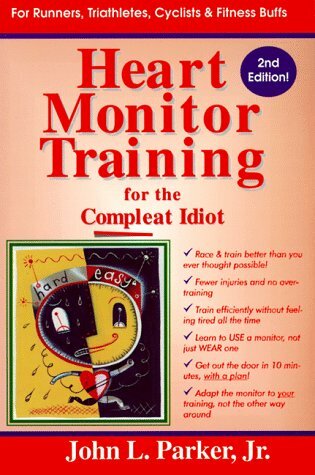 My new training training regime incorporates the techniques found in the above book, Heart Monitor Training for the Complete Idiot by John L. Parker, Jr. It has only been a week, but I am already a believer! I will be summing up the main ideas, but I highly recommend picking up a copy as there is a ton of valuable information in there. 1 – When running, it is best to run to a target “heart rate” rather than a target “pace”. The reason for this is pretty simple. On some days is easy to run a 7:30 pace, other days its not. Heart rate is an extremely accurate indicator of effort. So running to a target effort ensures that your workouts are consistent and comparable. 2 – Alternate easy and hard days. The general rule is no more than 70% max heart rate on easy days and no less than 85% max heart rate on hard days. Again, this sounds simple, but you’d be surprised just how slow 70% is. I really allows your body to properly recover from the hard days. It also trains your body to be more efficient at burning fat (unlimited) rather than glycogen (limited). 3 – This easy / hard schedules allows you to train 7 days a week with less effort. It seems counter-intuitive, but its true. I ran 7 days this week and upped my mileage too, yet I feel better than when I was running only 5 days a week. The reason for this is my old training was ALL hard days! My new schedule is 7 days a week but only 3 of them are hard. So I will keep you all posted on my progress, but I am already see my pace getting faster while staying under 70%. It was extremely frustrating at first, but in just a short period of time things are starting to really make sense! This entry was posted in Books, Gear, Running and tagged Garmin Forerunner 305, Heart Rate, John L Parker. Bookmark the permalink.